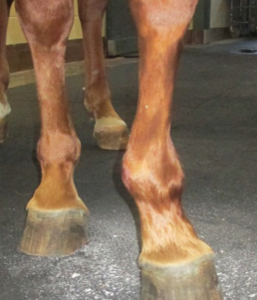 CASE HISTORY: A 12-year-old Quarter Horse mare was on a trail ride when the owner notice a peculiar twisting movement with the left front (LF) limb, but the mare appeared to walk out of it. Later in the ride when the mare began to canter, the owner noticed a lameness and turned around to head home. Shortly after, the mare stumbled while stepping over a log and exhibited an acute non-bearing lameness in the LF limb. The owner called for help and the mare was immediately transported to Tufts Hospital for Large Animals. PRESENTATION: Exam revealed a grade 4/5 LF lameness and a noticeably abnormal limb position of the LF as seen in the picture. What are your differential diagnoses? What would be your next step before proceeding? 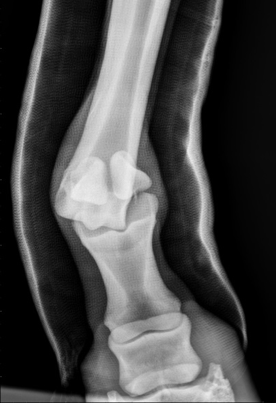 Differential diagnoses would include fracture and fetlock luxation/subluxation. The next step should be limb immobilization. In this case, a thick stack wrap with a medial splint was applied before the mare was moved. Additional diagnostics included radiographs which revealed luxation of the metacarpophalangeal joint followed by an ultrasound exam to evaluate the soft tissue structures. 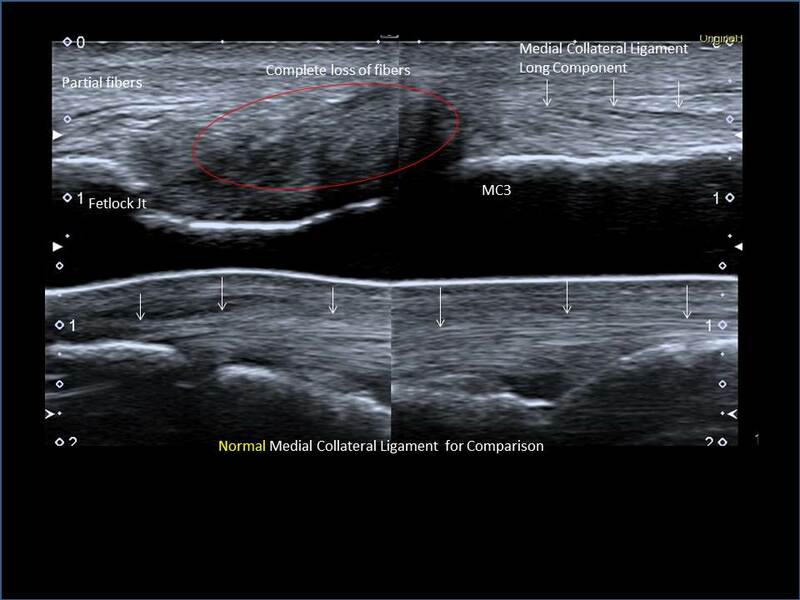 What is your diagnosis based on the ultrasound video below? The video shows a complete rupture of the medial collateral ligament of the metacarpophalangeal joint. The mare was treated with a lower limb cast to immobilize the joint and stall rest. 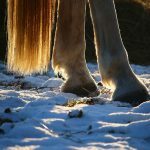 The equine fetlock joint is supported by medial and lateral collateral ligaments, each of which consists of a long (or superficial) component and a short (or deep) component. The long component originates proximal to the supracondylar fossa and courses over the joint in a vertical plane to insert on the proximal aspect of P1. The short component arises out of the supracondylar fossa and runs in a dorsoproximal to palmarodistal direction. -All horses were lame, with a lameness range of 2/5-4/5. -No biaxial ruptures were detected, though nine out of 17 horses had collateral ligament desmitis on the non-ruptured side of the joint. 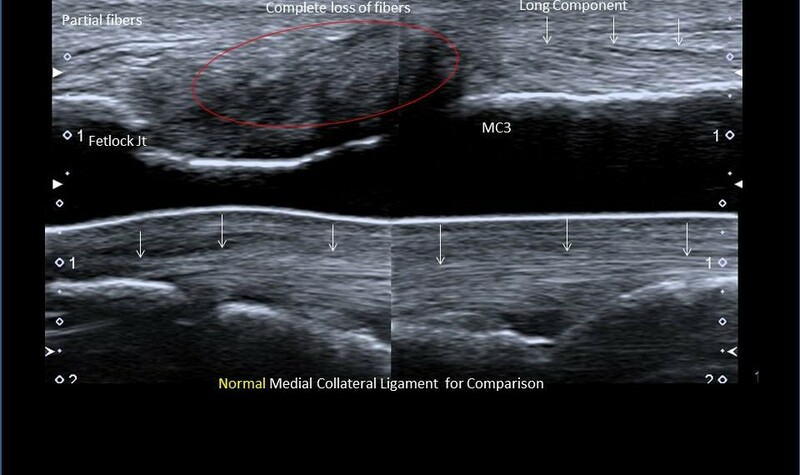 -Palpable joint instability was only detected in nine out of 17 horses, with four horses demonstrating luxation. 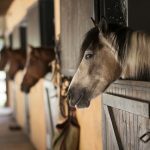 -All horses were managed with stall confinement, limb immobilization and gradual return to exercise. 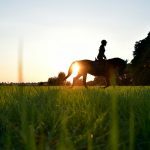 Eight horses returned to riding, two returned to breeding, two were retired, two were euthanized and three were doing well 86-139 days post injury. Rupture of collateral ligaments in metacarpophalangeal and metatarsophalangeal joints in horses: 17 cases (1999-2005), JAVMA 233: 3, 456-62. The Large Animal Ultrasound Service consists of Drs. 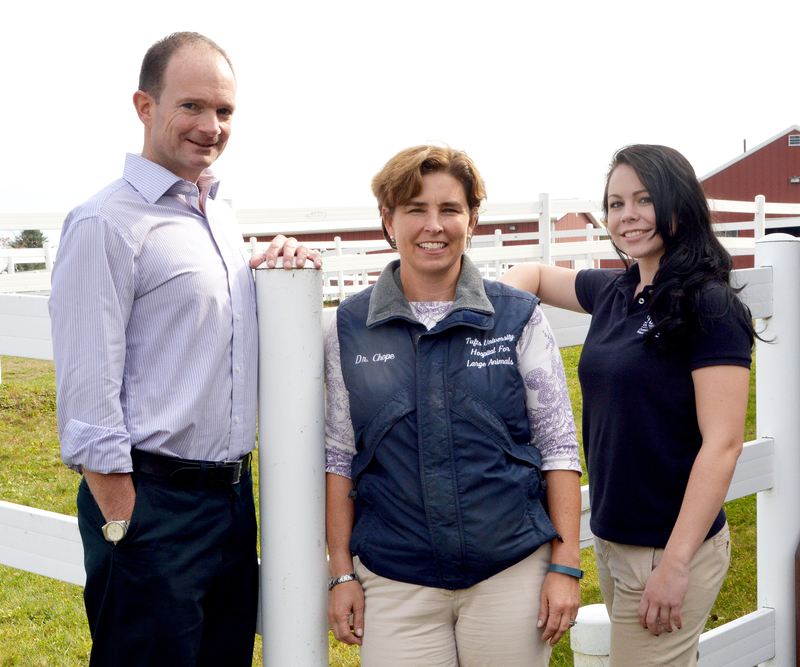 Wade Tenney and Kate Chope and veterinary liaison Erin Synnott. Drs. Tenney and Chope are both academically-trained ultrasonographers with a total of 28 years of ultrasound experience between them. The Large Animal Ultrasound Service works closely with the Sports Medicine, Internal Medicine and General Surgery services providing ultrasound exams for horses from all over the Northeast. They also provide “Ultrasound Only” appointments for those cases that have been worked up by a referring veterinarian and only require an ultrasound consultation. Exams include: musculoskeletal, abdominal, thoracic, cardiac, and wound investigation as well ultrasound guided procedures such as joint injections, biopsies and intra-lesional injections with biologics. Dr. Tenney completed his undergraduate degree at Cornell University where he was on the varsity Polo Team, and achieved his veterinary degree at Colorado State University. He worked at three large referral hospital prior to joining Tufts in 2013 (Littleton Equine Medical Center, Littleton, CO; B.W. Furlong & Associates, Oldwick, NJ; Steinbeck Country Equine Clinic, Salinas, CA). 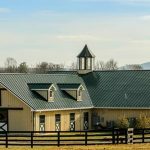 He has also spent considerable time working at the HITS horse show circuit in Thermal, CA and the Winter Equestrian Festival in Wellington, FL. 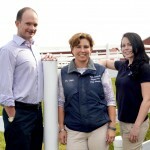 Dr. Tenney spends some of his off-clinics time working as an FEI Veterinary Delegate at show jumping, eventing, dressage and para-dressage competitions across the country. Dr. Chope graduated from the University of Pennsylvania School of Veterinary Medicine in 1996. She worked in mixed private practice for two years prior to completing a two-year fellowship in equine cardiology and ultrasound under Dr. Virginia Reef at the University of Pennsylvania’s New Bolton Center. She then worked as a lecturer in the Department of Equine Cardiology and Ultrasound at New Bolton Center for an additional year. In 2003, she joined the Tufts University School of Veterinary Medicine to establish a dedicated large animal ultrasound service there. Dr. Chope is currently a Clinical Assistant Professor in the Equine Ultrasound Service at Cummings School of Veterinary Medicine. She has lectured and taught wet-labs on equine ultrasound extensively at national and international conferences and has contributed to several clinical articles in peer reviewed veterinary journals. Erin Synnott is a graduate of UMass Amherst with a Bachelor’s Degree in Animal Science. Erin is an avid animal lover and brings 20 years of horse experience to the team, ranging from instructing lessons and managing farms to professional equine grooming for international-quality performance horses. Always eager to learn, she continues to expand her knowledge beyond her schooling and regular work day, studying veterinary medicine in both the small and large animal hospitals with hopes to receive her veterinary technician’s certification in Massachusetts this summer. In her time away from Tufts, she trains in dressage under a USDF bronze, silver, and gold medalist, as well as instructs her own lessons. 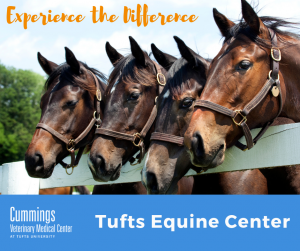 If you would like any additional information on the Large Animal Ultrasound Service, please feel free to call our direct line at 508-948-7695 or you may reach us via email at hlaultrasound@tufts.edu.